Supporting the facts and figures in your blog with appropriate and corresponding tables is an effective way to make your blog more powerful and impactful. These tables act as great visuals and also impart relevant information to your prospective clients in an arranged manner. In simple words, your primary message gets highlighted by these tabular illustrations. Moreover, tables help your audience to grasp the meaning of the data quickly which increases user engagement exponentially. Even though the tables are so important, they are not one of the core features of WordPress. However, WordPress being the most effective CMS in the world has a solution for almost anything and everything. If you’re wondering how then plugins are the answer. Plugins are a core part of WordPress that enable you to add features and functionalities to your WordPress site. Hence, to help you work with tables on your site, we have compiled a list of Best WordPress Table Plugins. Some of these also support other useful features that come in handy for your WordPress site. Take a look. TablePress is considered to be one of the best WordPress table builder plugins to create and manage HTML tables. It allows you to import data from different sources like Excel, HTML, CSV, and JSON and create customizable tables for posts, pages, or text widgets easily. With a user-friendly interface, this free plugin generates tables in the form of shortcodes that can be used anywhere on your site. Easy to manage via TablePress Menu, it is easily searchable and supports multiple languages and easy pagination. We would recommend you to go with the incredible TablePress plugin if you are looking to use tables effectively on your site. Ninja Tables is another extremely robust and advanced WordPress table builder plugin that can be used to create different types of HTML tables easily. The best thing about this free plugin is that it allows you to create responsive tables with a simple column builder. This means you need no coding at all. Equipped with powerful search functionality, it comes with amazing frontend table styles like Bootstrap 3, Bootstrap 4 and Footables. It is easy to configure and easier to use. Not only this but this superfast plugin also imports and exports data easily from other plugins like TablePress and Ultimate Tables Plugin. Use this incredible plugin if you need a simple, user-friendly plugin to insert mobile responsive tables on your WordPress site within seconds. If you have any issues, their excellent support team is always there for you. Create powerful data comparison tables right from your WordPress dashboard with the awesome Table Maker WordPress plugin. Easy to use, it enables you to add columns, rows, header color, headings, subheadings and even all types of data in the most effective way among all plugins. It is highly responsive and comes with a simple and easy to use design. With multiple import and export options, use this plugin to create and insert comparison tables, TOP tables, and specification tables on your WordPress site wherever you desire. Ultimate Tables is one of the best WordPress table plugin to create big tables with a lot of data. Available for free, this plugin helps you to manage huge lumps of data efficiently. Create incredibly powerful and responsive tables with multiple skins to increase your site readability. What’s better is that multiple tables can be inserted simultaneously saving considerable time and efforts. Equipped with a helpful search box and pagination, it allows easy creation and management of continually updated tables with sorting options. Use this plugin and insert tables with huge volumes of data anywhere on your website. Producing SEO friendly data tables, Data Tables generator is a unique WordPress table plugin that allows you to generate responsive tables from the admin panel. Easy and quick to use, it is equipped with features like interactive charts and graphs, sorting, pagination, and filtering. It also lets you edit the table caption, header, and footer with customization options like font styles, and color option for cells and fonts. It also allows easy import and export of data from CSV, Excel, Google Sheets. The best thing about this plugin is that it also supports an auto-update option for Google Sheets. Magic Liquidizer Responsive Table is a simple and lightweight plugin for tables that converts simple HTML tables into highly responsive tables. Not only for tables, but it can also be used for responsive images, texts, forms, and navigation menu. This plugin is considered best for small screens as it collapses the columns into rows and ensures that the data is displayed crisply. One of the best responsive plugins for Table building, use this plugin if you need high fluidity and cross-browser compatibility for all data on your site. Easy Table of Contents is the ultimate plugin to create a table of contents into your posts, pages, and custom post types. User-friendly and focused, this plugin automatically generates a table of contents by parsing the relevant contents for headers. These tables are highly customizable and easy to edit and update. It comes with elegant built-in themes, and if these don’t work for you, you can create your customized themes too. It is also loaded with some widgets to enable better placing of tables. Use this plugin, if you need to create a highly customizable table of contents or a normal table. 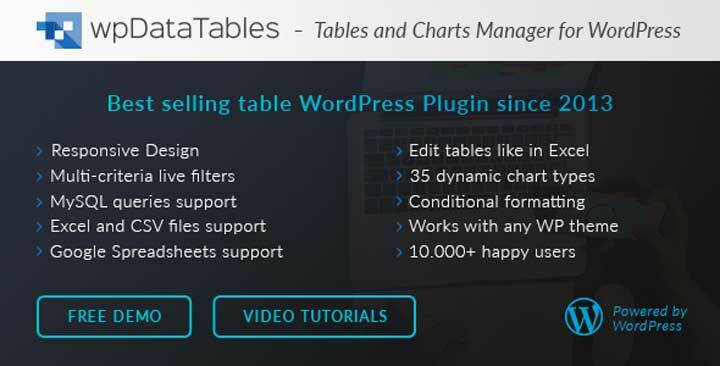 One of the best premium WordPress table plugins, the wpDataTables plugin is a complete solution for responsive Tables, Spreadsheets and Charts in WordPress. It acts as an efficient data manager for your site. Easy and quick to configure and execute, this plugin supports great import features that allow you to create tables directly from your WordPress dashboard. Supported in multiple languages, elaborate charts can be prepared from the table data instantly. Use this plugin today to create elaborate tables and illustrations that attract users on your site and make it stand out. 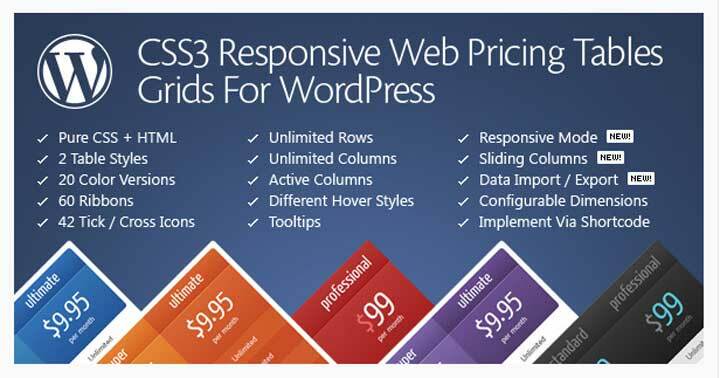 As the name suggests, CSS3 Responsive WordPress Compare Pricing Tables is a responsive plugin to create Pricing Tables on your WordPress site. It comes with two preloaded table styles and twenty color versions and supports features like a responsive mode configuration and an elaborate admin panel with live configuration. This WordPress table plugin contains elaborate customization options for tables, rows, columns and table cells. Fast and easy to use, this useful plugin is best for sites that need to compare and display the prices of different products a.nd services for their users. 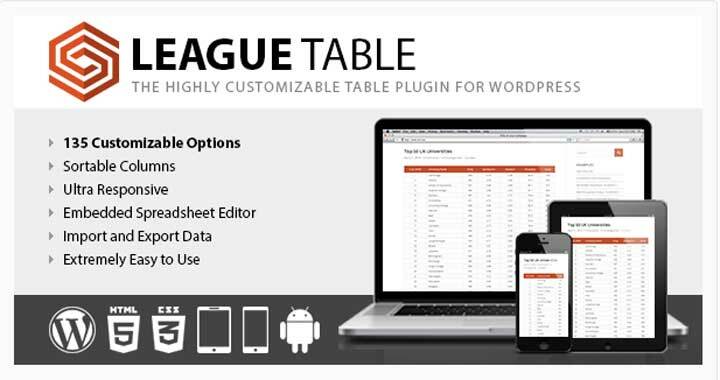 One of the most versatile table plugins on WordPress, the League Table plugin was created for sports websites. However, flexible customization options make it suitable both for business as well as personal sites. Fast and easy to use, this plugin allows you to create elegant sortable and responsive tables wherever you want. You can insert tables inside your posts, custom post types, pages and widget areas. Use this plugin and create your desired table with advanced options easily in about 30 seconds. 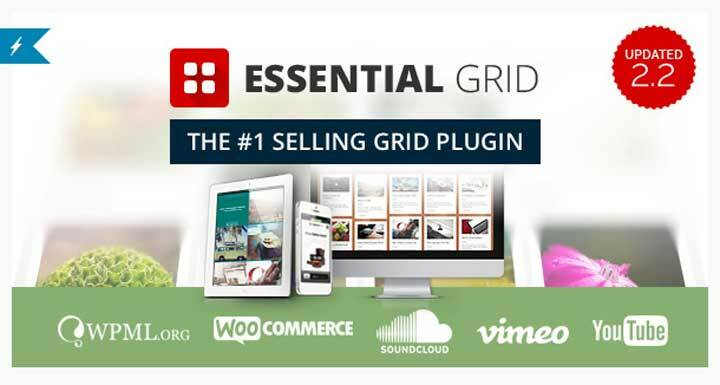 Essential Grid Gallery is a premium WordPress table plugin that enables you to show the various content formats in elaborate gallery grids. These gallery grids are highly customizable and can be used according to the requirement of your site anywhere. Some of the formats that can be generated using this incredible plugin are blogs, portfolios, price tables, galleries, services, WooCommerce shops, product sliders, testimonials and much more. Design and manage the critical part of your content with this useful plugin and increase the readability of your site exponentially. 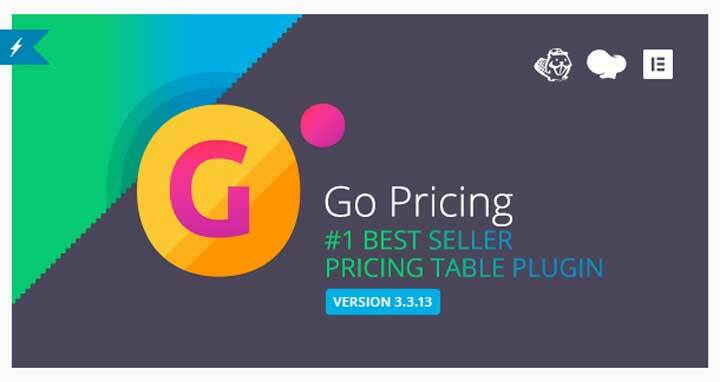 Easy to configure and use, Go Pricing plugin is considered to be the best WP table plugin to create pricing or comparison tables for your WordPress site. It supports different media elements like audio, image, video and even maps. Equipped with a clean user interface, it helps to generate unique and engaging tables and content with features like Google fonts, common, linecon, and material icon. With factors like enabled line preview and high customization, this plugin allows you to shape your content exactly as you want. The best feature of this plugin is a small footprint which enables your site to load content only when required. This leads to a considerable improvement in site and page loading speeds too. Any Other WordPress Table Plugins? We hope that now you have a clear understanding of which WordPress Table Plugins to use for your WordPress site. Remember, tables are essential for your site to increase readability and customer satisfaction. Tables are also highly useful to compare things. Hence, focus on what you have read about the plugins above and choose the best plugin that suits your site.